Food trucks can be found around the city of Richmond serving up local food at low prices. http://www.richmondfoodtruckassociation.com/#trucks gives a list of the trucks. Each truck has their own website with menu and prices. The Kickers have a rotating menu from game to game, and you can find out what food trucks will be at what game on the Kickers’ website. If a taco truck is at the same game, get in line early. You can get a huge burrito and three amazing tacos al pastor for $12. There are also a couple of food stands with standard football fare: hot dogs ($3), chili or cheese hot dog ($4), and cheeseburger ($4). Lemonade is $5 with unlimited refills and a Papa John’s 8-inch pizza is $7. Beer tickets are $5 and the typical line up consists of Bud Light, Modelo, and Kick It Hunny, the official beer of the Richmond Kickers. Washington DC has three major airports; Ronald Reagan Washington National Airport (DCA), Washington Dulles International Airport (IAD) and Baltimore/Washington International Airport (BWI). You are likely to fly into Dulles. It is huge and the setting for Die Hard 2. Before I flew there last year, I made a point of watching the film before I went there. Those who are nervous flyers may decide to avoid watching it. Richmond is 108 miles from Washington DC, which can be travelled in under 2 hours by car via Interstate 95. Just south of the stadium is Maymont Park, a 100-acre, 19th-century estate complete with gardens, waterfalls, petting zoo, and a hands-on nature center. Admission is good to the gardens and stable, and there is a small fee of $3 for the nature centre. This place is particularly beautiful during the spring and summer months which, during the USL season. For information go to www.visitrichmondva.com – It is an amazing site and has everything you need to know before planning your trip. Half a mile from the stadium is West Cary Street also known as Carytown. Along this one-mile stretch of road, you can find everything from all-American burgers to Italian and Japanese restaurants. Getting to Carytown is relatively easy, and there is plenty of parking in the surrounding area. 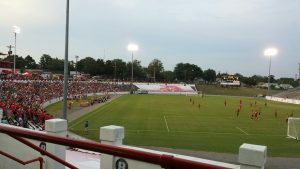 Gus’ Sports Bar and Grill (zip code 23220) is two miles from the stadium, and is the official sports bar of the Richmond Kickers. This place is a local favourite and a great place to go before the game if you are in Richmond all day. If you are just in to see the game, eat at the stadium, you will not be disappointed, and neither will your wallet. Parking: Free parking is available and tailgating is encouraged at all Kickers home games.